Exclusive residential complex ideal for religious families looking for real estate in Jerusalem. 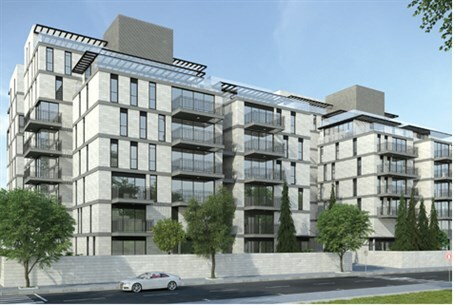 Quadra is an exclusive residential complex under construction in one of the most sought-after neighborhoods in Jerusalem. Location is king in real estate, and the location of this complex is excellent. It is situated in the Makor Hayim neighborhood adjacent to the chic areas of Baka and the German Colony, just a short walk from Emek Refaim, the trendy street that is lined with cafes, shops and mini-markets. Quadra overlooks Mesila Park, site of the original 19th-century Jaffa-Jerusalem railroad, today a charming landscaped park just a 10-minute walk from the new First Station complex at Jerusalem’s old train station. This area has an old world charm. In addition, it is both quiet and central because it has easy access to most of the city’s cultural, religious, commercial and entertainment centers. The area in which Quadra is located is much favored by religious families because it is within walking distance of many of the city’s major holy sites. On Shabbat and Jewish holidays, one can easily walk there. The area has a marked international ambience, with many overseas residents and young Israeli families attracted by the excellent schools. The name "Quadra" was not chosen by chance. The project is designed as a quadruple, consisting of four eight-story apartment buildings, with a total of 108 residential units. It is being built on a large 5,000 square meter plot of land, which will be transformed into a lovely park with lush trees, flowers and greenery. The estate was designed by Kimmel Eshkolot Architects, one of the leading architectural firms in Jerusalem. The design is lavish in its allotment of public areas, large underground parking spaces, private storage rooms for each apartment, lobbies, etc. Each building has its own entrance, expertly designed to ensure maximum privacy for the residents. One of the many selling points of this magnificent residential complex is the spa area, which includes a well-equipped gym and a swimming pool of half Olympic size, the only residential complex in that area to have a swimming pool and the only half Olympic size pool in a residential complex in Jerusalem. The project will be completed in December 2015, and residents can start moving in immediately after. To date, 80 percent of the available units have been sold, but several four-bedroom plus living room units are still available. In addition, Quadra is now offering penthouses with panoramic views and duplex garden apartments, some with private entrances and double height ceilings. The technical specifications of these apartments and the materials used are of the highest standard.